Four years of integrated effort has paid off when Laguna Phuket announced it was awarded precinct-level Silver Certification with EarthCheck, the first of its kind in Asia. This positions the destination resort as a leader in the unique worldwide group of sustainable tourism operators that are certified to the internationally recognised EarthCheck Company Standards with the exclusive EarthCheck science inside. The resort’s achievement through the certification process were remarkable: for example, Energy Consumption was 43.7% better than the average Best Practice; Potable Water Consumption was 46.8% better than the Best Practice level; Water Savings rating achieved was 5.7 Points better than the Best Practice level; Waste Sent to Landfill was 75.6% better than the Best Practice level, and Greenhouse Gas Emission was 35.8% above the average Best Practice level. 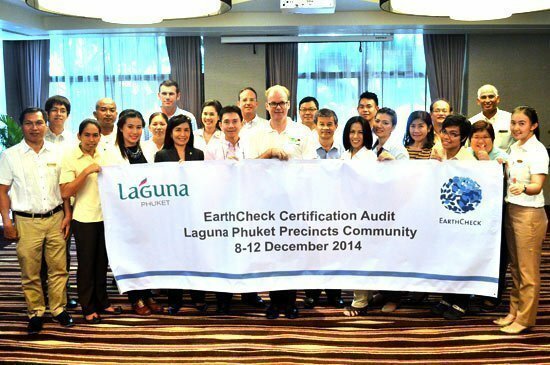 “By taking a scientific approach to measuring the effectiveness of their sustainability practices, Laguna Phuket was able to identify where they were out-performing others and where room for improvement remained,” explained EarthCheck CEO Stewart Moore. “Achieving certification is not an easy task and many organisations do not make it past the benchmarking stage. Securing a highly-ranked benchmarking result requires a strong commitment across all levels of an organization and the imbedding of sustainability principles into all policies and procedures,” Moore concluded. The sectors within the Laguna Phuket Precinct that have achieved Silver Certification comprise Angsana Laguna Phuket, Banyan Tree Phuket, Laguna Holiday Club Phuket Resort, Laguna Phuket Golf Club (18-hole golf course), Laguna Resorts & Hotels (Phuket office), Laguna Service Company Limited and Outrigger Laguna Phuket Resort & Villas.